Car crashes are a leading cause of death for children ages 1 to 13. Many times, deaths and injuries can be prevented by proper use of car seats, boosters and seat belts. On average, two children under 13 were killed per day in 2016 while riding in cars, SUVs, pickups, or vans. NHTSA and the Ad Council launched a new series of public service ads (PSAs) that urge parents and caregivers to protect their child’s future at every stage of life, by making sure they secure them in the correct car seat for their age, height, and weight. Interested in helping to spread the word? The campaign materials were created pro bono by Campbell Ewald, Casanova McCann, Mister Face, and Wordsworth & Booth and include English and Spanish radio, print, outdoor, and web banner ads. The English PSAs direct to NHTSA.gov/TheRightSeat and the Spanish PSAs direct to NHTSA.gov/Protegidos, where parents can find more information on how to determine if their child is in the right seat for his or her age and size. 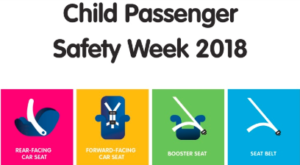 Use these free safety materials to generate awareness about child car safety in your community throughout the year.